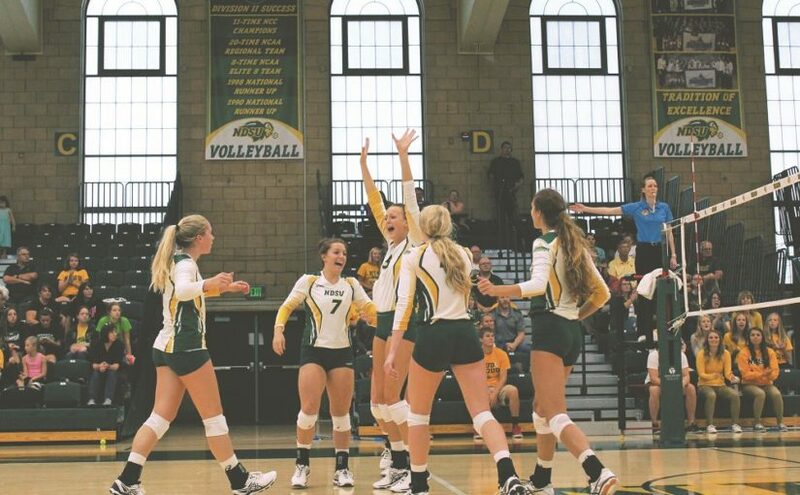 North Dakota State volleyball played host to first place Summit League South Dakota to close out their four game home stand this Tuesday night at Bentson Bunker Fieldhouse. After losing the first set, the Bison took the next three sets to win the match up 3-1 (19-25, 25-15, 25-22, 29-27), finishing with a 3-1 record while back home. With the win, the Bison snapped a three-match losing streak against South Dakota. After a rough first set, where the Bison were outhit .372 to .178, they came back and dominated the second set. The Bison hit .385 to South Dakota’s .000 to tie the match at one set apiece. This set also would set the tone for the rest of the way at the net. With heads up plays by Emily Minnick, Emily Miron and Hadley Steffen, this provided Brianna Rasmusson and Monica Claxton plenty of options, including Erika Gelzinyte and Alex Erickson. The third and crucial set was back and forth. The set consisted of 16 ties and 9 lead changes. The last tie would come at 21-all off a kill by Miron. Miron scored the next four points for the Bison to take the set and put NDSU up 2-1. The fourth set followed the same as the third. There were 18 ties and the lead changed seven times. South Dakota had set point twice in the closing minutes of the set, 26-25 and 27-26. The Bison closed out the fourth by kills Minnick, Steffen and Miron to win the set 29-27 and take the match 3-1. With the tough match up against USD, coach Kari Thompson had kind words about the girls. Minnick recorded a team high 17 kills with Steffen and Miron finishing with 14 each. Gelzinyte finished with seven kills to help the Bison outhit the Coyotes .211 to .181. Minnick also had a match-high of five blocks as the Bison held a 9-6 advantage in team blocks. Mikaela Purnell, who came up with 30 digs, was one of five players that came up with double-figure digs. Purnell reached 30 or more digs for the fourth time this season. Rasmusson had 39 assists to go along with her 11 digs to complete her ninth double-double, as Steffen also came up with 10 digs of her own to earn her ninth double-double as well. For South Dakota, Audrey Reeg finished with a match-high of 21 kills and 18 digs and Lindsey Brown connected for 10 kills. Lauren Mattison came up with a match high 31 digs. Brittany Jessen had 46 assists, 16 digs and four kills. NDSU (8-4 SL, 10-16) is scheduled to play at Fort Wayne (8-5 SL, 12-15) at 6:00 p.m. Nov. 4, and IUPUI (7-5 SL, 11-16) at 5:00 p.m. Nov. 5. Fort Wayne defeated IUPUI 3-0 on Tuesday night. Going into Tuesday’s matchup, the Bison where fourth in the Summit League standings. With the win against South Dakota and Fort Wayne defeating IUPUI, NDSU moved up to third place. This is important, for only six teams out of the nine can go to the Summit League Championship tournament with the top two teams receiving a first-round bye.